In the fall of 1952 the Council of the church appointed three young women to look for a place. …Throughout the fall and winter Carolyn Johnson, Jessie Henderson, and Sally Jumper searched…. In May we found that place. Our committee had looked at fifty farms. The last real estate office they visited called Gordon Cosby and said, “We have three girls here, who have indicated that your church is in the market for a farm. If you will send a responsible person, we will be glad to talk to him and show you what we have.” Gordon told the gentleman that we had no one more responsible than those girls and that if he would like to deal with us he would have to deal with them. They looked at three farms that day. The third was on the road to Damascus – a sign, had they been seeking one. It was approached from a tree-lined dirt road. When it came into view there was a long, panoramic sweep that included a house in reasonably good condition, barns, pasture land, woods, and a stream that could be dammed to make a pond. Each of us who went out to look at it knew with certainty that it belonged to us and we belonged to it. The members agreed unanimously on the purchase. The Lodge of the Carpenter was built over a two-year period by church members. The Lodge windows open onto the woods and meadows. A large fireplace is the focal point for the Yoke Room, where those on silent retreat gather. Several pieces of original art are displayed, including a bas relief in the entry foyer depicting moments in Jesus’ life and a charcoal drawing of Christ by Robert Natkin. In silence we left the Lodge and retreat area…Here in this portion of Dayspring solitude and silence can be found. Here a person’s aloneness with God is respected and protected….On [this] day we began our instruction in the nature of retreat. Some of our teachers were John Casteel, through his writings, and Douglas Steere, through his book Time to Spare. More than 200 trees were planted – both shade and fruit-bearing – following a design planned by the chief arborist of the National Arboretum. Trails were cleared through 78 acres of woodland and along the creek that borders the property. Named for long-time church member and Dayspring resident Alice Fenn, Alice's Pond was built at the back of The Farmhouse, down the hillside. The chief stonemason of the Iona Christian Community in Scotland, Ian Cramb, visited Dayspring for a few summer weeks. He built an arching stone bridge over the small brook flowing into Alice’s Pond. A camp area was developed on the road to The Lodge, just after entering the woods past the Farmhouse. Tent platforms, a picnic pavilion with a kitchen, and a bathhouse still provide a place to host family events as well as camps for children from CofS urban ministries. The Pavilion is used for Sunday worship services in the summer. Three residences were built as housing for a farm manager and others working on the property. Members of the Dayspring congregation still occupy these homes. Two irrigation ponds were constructed to support agricultural activities as well as to enhance the environment for retreat visitors and wildlife. “The Lake of the Saints” is the largest and can be seen toward the east from the Farmhouse. The second is down the hill from The Lodge: “Merton Pond,” named after the well-known monk and mystic Thomas Merton. Construction was started on a red brick building near The Lodge to provide overnight accommodations for retreatants. Two wings – Matthew and Mark – house 18 small rooms with bed, desk, chair and sink. The Gatehouse, a residence, was built near the upper entrance to Dayspring. By this time, other churches in the Washington area were using The Lodge of the Carpenter – this year 49 of them. The Wellspring Conference Center was constructed to support the call of the Wellspring Mission Group. The building was designed as an assembly of multiple triangles. The main room is a polyhedron with a triangle base and three equal triangle roofs with a common vortex. Vertical glass walls form the base of the three-sided skylight. At two corners of the meeting room, triangular additions provide space for offices, a kitchen, and a handicapped accessible suite. A triangular covered entry patio completes the theme. Near the Center, a residence was built for the Wellspring director, along with three cabins – Siloam, Bethsaida, and Jacob’s Well – which housed participants in the Wellspring programs. Two additional residences were constructed near the end of the Wellspring entrance road: Woodside and Rehoboth. A cottage was added off the side of The Farmhouse as a residence for the Dayspring host. A 19th century barn near the Farmhouse burned. The stone foundation remains. 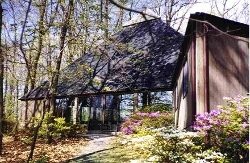 A residence was built near the Inn and Lodge to house the Silent Retreat director. A hay barn and equipment shop near the 19th century barn foundation burned, leaving only a small block building which was used in subsequent years as a farm market and is now a workshop. A large shed for equipment maintenance and storage was built in a central location in the farm fields. What we did not know [when we started Dayspring], at least I did not know at the level I know it now, is that we would never have been able to have reached out across the world…we would not have been able to have reached out into housing and into jobs and educational opportunities with children and parenting, to the children in our neighborhood, and health needs and all the rest, if it hadn’t been for Dayspring, because this is the heartbeat of it. And the missions will never move more rapidly and more extensively than what happens in this place….That’s the thing that I’m most aware of, and I want to give thanks to the Holy Spirit for what has happened. Potter’s House Press published Dayspring. Co-editor Cheryl Hellner described it as “a book about that other way of seeing…the way Jesus taught when he told parables…to stand within a thing, a person, or a place and to look out from the inside…to stand in the middle of the story and let the story show you how to see.” The stories in this volume are about Robert, the Dayspring farm manager; Bud, the Dayspring potter; and Alice, the oldest member of Dayspring Church. Recognizing that Dayspring is a place of sanctuary for both silence and wildlife habitat, a 43-acre portion of agricultural fields was place into the conservation program of the U.S. Department of Agriculture. The purpose of the program is to take land out of production and manage it to benefit wildlife and enhance natural land and water quality. After several years of Dayspring's participation in this program, the county wildlife ecologist visited and observed that our fields were some of the county's best habitat for grassland nesting birds. For thousands of years peoples of many religious traditions have used the labyrinth as a symbol for their search for meaning and guidance. During the Crusades, labyrinths were used to represent pilgrimage to the Holy Land. Today they are used for reflection, meditation, and comfort. Located at the top of the hill above Alice's Pond, the labyrinth at Dayspring was crafted using stones from the land. Near the old barn and market building, two cottages were constructed to house Earth Ministry staff. They feature green building design, passive and active solar, superinsulation, local building materials, rain barrels, and other approaches to energy and water conservation. A solar greenhouse and permaculture garden were developed by Earth Ministry staff. The ministry at Wellspring ended. 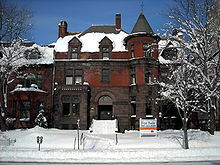 With the sale of The Church of the Saviour building at 2025 Massachusetts Avenue in Washington, DC, Dayspring became the only property collectively owned by the sister faith communities of The Church of the Saviour. An 'Earth Celebration' was held at Dayspring in June for all nine sister faith communities in the tradition of The Church of the Saviour. We make attempts to be objective about many phases of our church’s life, knowing full well that we do not wholly succeed. But when it comes to Dayspring, we do not even try. We love all her ways: the woods, the fields, the trails, quiet spots and spacious stretches, the lessons we have learned there, the stillborn dreams we have had for this place as well as those that have found root in her soil. We even find the seasons different here, for summer and winter and spring and fall touch this land in a lavish, spendthrift way, or so it seems to those of us who grew up in cities of concrete…. It has made contemplatives of us all, even those who take a dim view of the mystical life.